We’ll never be as perfect as Jiro Ono. None of us. There is no hope of reaching this man’s level of excellence in whatever field it is we have chosen to call a career. Jiro is both an inspiration and menace. Inspiring us to work harder, menacing us with the reality that we will never be able to work this hard. He’s 85 and still working 14 hour days at his 3 Michelin star sushi restaurant, Sukiyabashi Jiro, in Japan. It should also be noted that this 10 seat sushi bar is located in a Tokyo subway, where the average meal costs $300 and takes all of 15 minutes to sit, eat and leave. This makes it the most expense restaurant per minute, in the world. Second time director, David Gleb, originally set out to simply make a documentary about Tokyo’s finest sushi chefs. The plan got complicated once he encountered Jiro. Instead he made a documentary simply about one, the one, the best sushi chef in the world. Gleb kept things simple with a delicate finesse as well as a refined tone with his shots, use of slow motion and what has now become a cliched Phillip Glass score for these type of docs. While watching Jiro, one can’t help become both hungry and aware that the film technique is mimicking Jiro’s graceful and elegant methods. 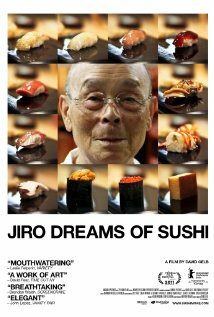 Much like sushi itself, Jiro Dreams of Sushi is not for everybody. It’s pacing is slow, (there is a 10 minute featurette about the “Rice Master”) the photography while beautiful is a bit claustrophobic at times and Jiro himself can be a bit much. He insists on watching his customers eat each piece he places before them and demands they eat it as it hits the woodblock, rather than at their leisure. However, my soon to be wife watched this with me and loved it, while the thought of willingly placing raw fish in her mouth, while the chef watches or not, makes her ill. If you’re a fan of Big Night, Eat Drink Man Woman or even the recent Julie and Julia my bet is that you’ll not only swallow this one, but enjoy it all the way down. Posted on Monday, August 20th, 2012 at 2:49 am and is filed under Reviews.